The Order of Saint Illuminatus is a Polling Order award bestowed by the Baronage of Starkhafn, based on recommendations from current members of the Order. 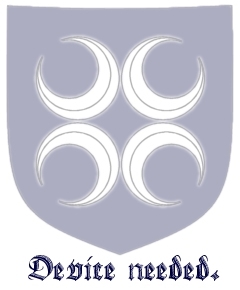 Members of the Order are polled at Starkhafn Yule, in consultation with Their Excellencies, to determine those individuals who may be worthy of recognition. New members of the Orders are traditionally elevated at Starkhafn Anniversary. This order was formerly known as The Order of the Illumination of Starkhafn. The following badge associated with Starkhafn was registered in October of 1981 (via Caid) and associated with usage in August of 2016 (via Caid): Per bend azure and sable, on a bend argent three flames proper. "Members of the Illumination have demonstrated excellence in a particular art or scientific endeavor, which shall be named at the bestowing of the award. Additionally, Members of the Illumination have brought honor to themselves and the Barony through teaching, mentoring, and sharing that art or science with others." This page was last modified on 29 March 2019, at 19:04.